Hotel Transylvania 3: Summer Vacation Is No Vacation! Just through its playful riffing on famous monsters and legends, the first two entries in the Hotel Transylvania franchise provided some seriously goofy summer fun. The trick was finding a core of great characters and some complementary secondary characters that could hold the screen in support. Hotel Transylvania 3: Summer Vacation spends so much time on its core characters – and one newcomer – that those delightfully weird secondary characters are left with little to do. The result is a mediocre film that wears out its welcome well before the (admittedly delightful) closing credits. A Hotel on the Water Teaser: Hotel Transylvania 3: Summer Vacation! HOTEL TRANSYLVANIA 3: SUMMER VACATION – (L-R) Vlad (Mel Brooks), Murray the Mummy (Keegan-Michael Key), Invisible Man (David Spade), Dracula (Adam Sandler), Mavis (Selena Gomez), Frank (Kevin James) and Eunice (Fran Drescher) – Courtesy of Sony Pictures Animation. It looks like Drac (Adam Sandler) and his monstrous family are going to take a summer vacation – courtesy of Mavis (Selena Gomez). Hotel Transylvania 3: Summer Vacation opens on July 13, 2018. First Look Image: Hotel Transylvania 3! Guess what Mavis has given her family and friends. A family voyage on a luxury monster cruise ship! Hotel Transylvania 3 opens on July 13, 2018. The Meyerowitz Stories (New and Selected) – (L-R) Matthew (Ben Stiller), Danny (Adam Sandler) and Jean Meyerowitz (Elizabeth Marvel) – Photo by Atsushi Nishijima/Courtesy of Netflix. The Meyerowitz Stories (New and Selected) is the emotional and comic intergenerational tale of adult siblings contending with the long shadow their strong-willed father has cast over their lives. Written and directed by Noah Baumbach, The Meyerowitz Stories (New and Selected) will premiere on Netflix and select theaters on October 13th. Fake Manager Sets Real Open Casting Call: Sandy Wexler Management! Adam Sandler plays Sandy Wexler, Hollywood Agent/Manager and Talent Scout, in the movie of the same name that’s coming to Netflix on April 14th. In real life, Netflix and Sandy are holding an open casting call for a walk-on role in the next Adam Sandler movie. Applicants are required to submit a video showcasing their talent and submit it between now and April 7th. We’re Rolling Trailer: Sandy Wexler! Sandy Wexler is a talent agent whose clients exist on the fringes of show biz. Sandy Wexler is also Adam Sandler. Sandy Wexler premieres on Netflix on April 14th. The trailer follows the break. Netflix has dropped a new trailer for Adam Sandler’s The Do-Over – the tale of a couple of idiots who get together at their 25-year High School Reunion and decide to makeover their lives. The Do-Over also stars David Spade, Paula Patton and Luis Guzman. It premieres on Friday, May 27th. Check out the NSFW trailer after the break. Absurd Trailer: The Ridiculous 6! Adam Sandler’s The Ridiculous 6 has fart gags, a cameo by that whitest of white rappers, Vanilla Ice and gags that caused the film’s Native American extras to leave the set. Hotel Transylvania 2 reunites the crazy crew of characters from Hotel Transylvania with the addition of a couple of new characters – Johnny and Mavis’ son Dennis, and Dracula’s father, old school vampire Vlad. Plus the hotel is now also opens to (*gasp*) humans! Check out the new trailer after the jump. Hotel Transylvania 2 opens on September 25th. Somehow, aliens misinterpreted an attempt at communication that depicted, among other things, several video games, as a declaration of war. They created Godzilla-sized versions of those videogames and sent them off to destroy the Earth. On July 24th, the fate of the Earth will be in the hands of a group of ’80s videogame champions. Check out the new trailer for Pixels after the jump. Teaser Poster: Hotel Transylvania 2! 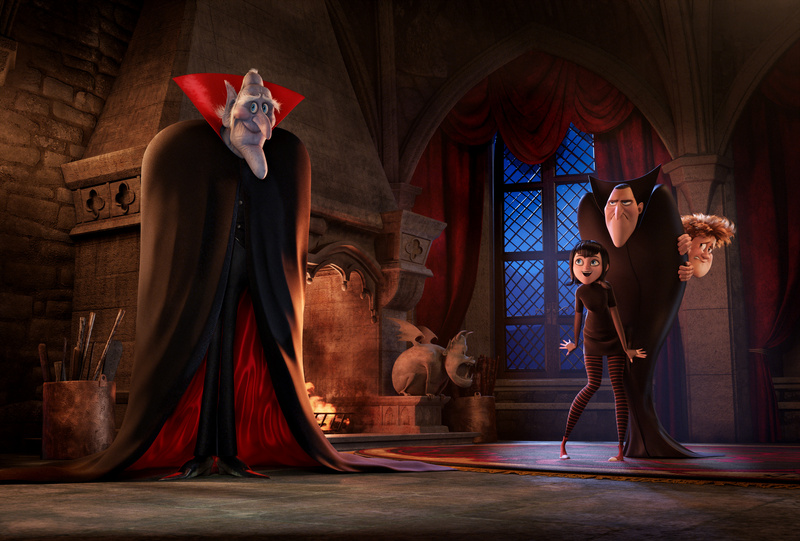 In Hotel Transylvania 2, Grandpa Vlad comes to visit – and he’s very old school! Sony has just released the teaser poster for the movie. Check it out after the jump. Hotel Transylvania 2 opens on September 25th.